I headed to the bakery for a few things this afternoon after running some errands. Not a good idea to stop in hungry for snack time! Back at the fort, hot dogs were on the menu. Or rather, organic chicken sausages on bread. Matt wasn’t able to make hot dog buns upon request this AM, so we improvised. Worked pretty well! Tonight should be good – Gossip Girl is on!! All I can say: Yum. o.
I love delicious dinners that just HIT the spot. Have fun watching your show! 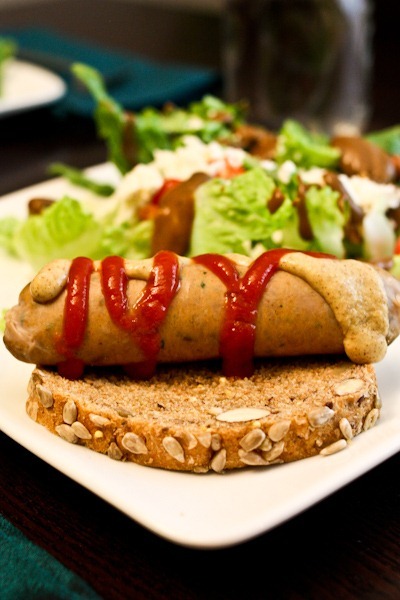 Chicken sausage needs to make a comeback in one of my dinners soon. I forgot how much I love it! Mmmm, looks delicious as always! I’ve recently discovered chicken sausage, and I love it. I’ve been using it in all kinds of recipes. I haven’t been able to find a chicken sausage that we like. What brand do you use? I don’t remember the name – it’s the Whole foods one with a bike on the front I think? This looks delicious! I actually made rice krispy treats for my neighbors to thank them for their housewarming gifts last year when we moved into our new home. rice krispie treats are definitely one of my all time favorite desserts. and the variation possibilities are endless!! always impressed with your willpower around the yummy bakery desserts. I want to make these rice treats tomorrow. I love making them all different ways. There are so many great options. Being vegan we use Rice Mellow to make them. Delish! What’s “in” a chicken sausage? Paula, is that necessary? If it was just chicken, if would be called that. I’ve never eaten sausages before and assumed it was similar to hog dogs with added ingredients and seasonings. It was just a question and you didn’t have to waste your energy. Even though i just know Paula was doing her best to be helpful… this might be what you are after Jen. It’s the nutritional label from the chicken sausage Kath was eating, from the company web site..
You are just so sweet, Carolyn. And no i am not defending anyone here.. quite the opposite.. ..
That dressing looks great! Hope we get to see the recipe! OMG! We had organic chicken sausages for dinner last night! SOOO good! Wish we had our own bakery to make fresh buns 🙂 Mm-mm-good. I remember making rice Krispie treats for you girls and having to use all my willpower not to eat the whole batch before you got home from school! I would have named this post “childhood favs” …rice krispies and hotdogs! I love chicken sausages! I had some chicken meatballs in my dinner tonight, so good! That chicken sausage on Dakota bread looks delicious! This tempts me to go back through my childhood faves and try to make them healthier. I make a different version of something with rice krispies or jacked up rice krispie treats in it at least once a month! Yesterday it was cocoa krispies peanut butter smores bars. I love RKTreats. Seriously, I could keep on creating and inventing different desserts using them if I had a football team to help me eat it all 🙂 Those strawberry ones look great! I want to eat your s’mores bars! I find it interesting how Americans refer to them as Rice Krispie “treats,” while here in Canada, they are definitely Rice Krispie “squares.” But that’s just me. You know, I used to say ‘squares’. I think Kellogs came out with a store-bought kind that they named RK treats and then we all started calling them that. But they used to be squares when I was younger! Interesting transition.. I always cut mine bigger than a square. 🙂 Maybe that’s where it came from. I love meals like that! That salad looks awesome! Rice Krispie treats are my favorite easy dessert to prepare. I don’t make them often, but when I do, YUM! I love adding sprinkles, m&ms, or chocolate chips. 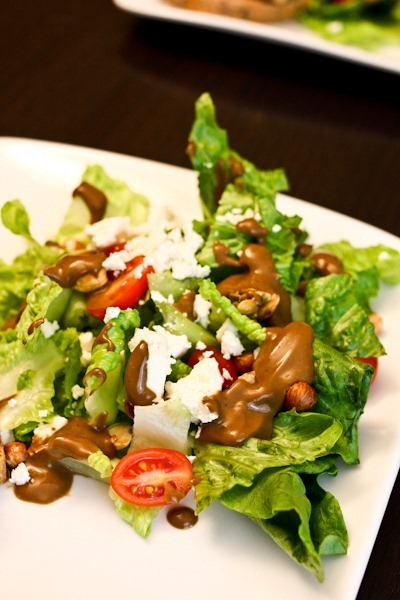 I must be craving chocolate or something because your salad dressing looked like chocolate sauce to me. 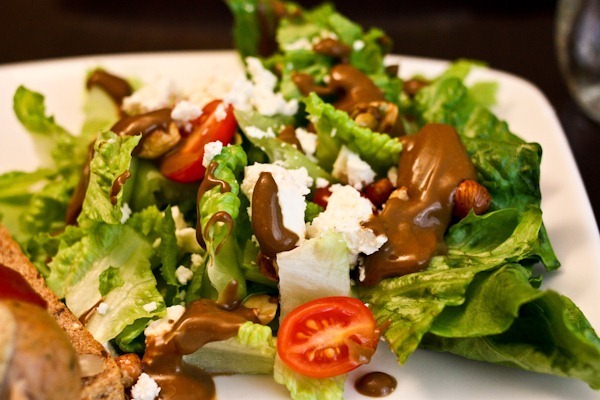 I can’t say that a cocoa based salad dressing sounds all that bad. I love rice krispies!! Yum. Love the willy wanka-ness description! Rice Krispie treats are so delicious! And so very easy to make. Very cute with the sprinkles. Have you been watching Gossip Girl all along this season? I am really addicted right now…so intense, each episode! Yup!! Last night was good! I haven’t had a rice krispie treat in forever!! They definitely remind me of elementary school! Oh yum. Dinner looks so great. Really curious about that dressing recipe! 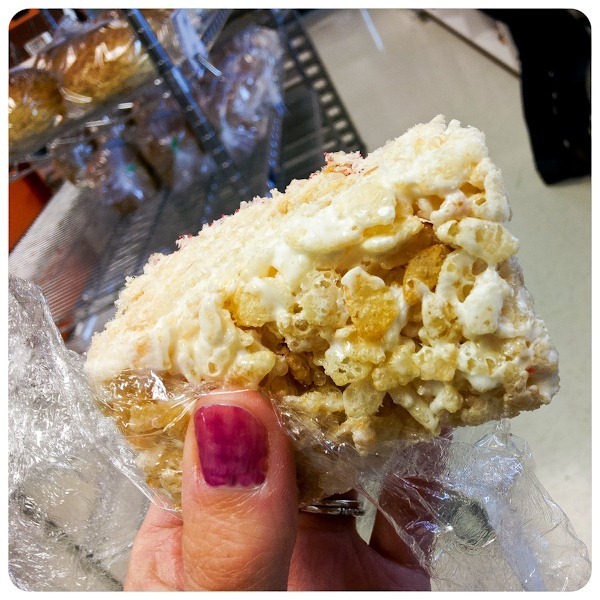 Rice krispie treats are my favorite “baked good” (though not baked…hmmm). They’re one of the few things I can’t keep in my house due to lack of self-control…and Valentine’s ones look even more appealing! Um perhaps this is a strange question but assume you’d know a whole lot more than me, but are chicken sausages as bad for you as say a hot fog or just regular sausages?? Generally hot dogs are considered bad because of the added preservatives and things and a high fat content. 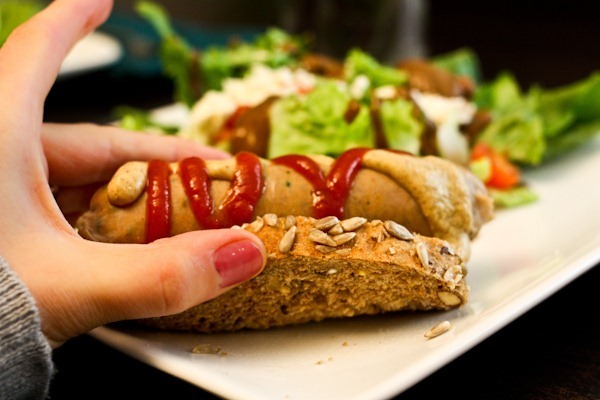 They are organic hot dogs that I think are fine to enjoy every now and then. 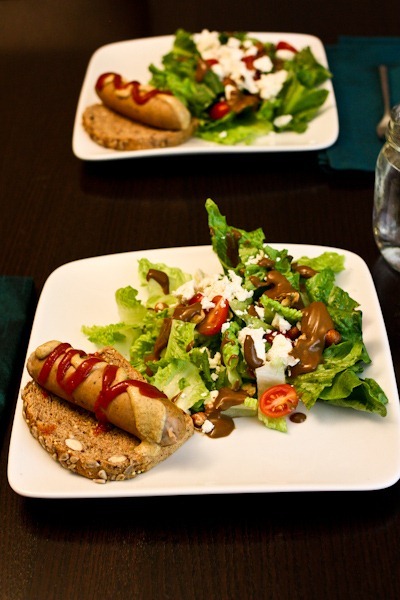 Sausages get a bad rap because of their high fat content as well, and chicken sausages generally are much leaner than traditional pork sausages. Ones that are made with organic meal with minimal added ingredients other than spices/seasonings seem totally fine to me. Crispy squares are one of life’s yummiest little treats =) Love the Valentine’s twist to them! 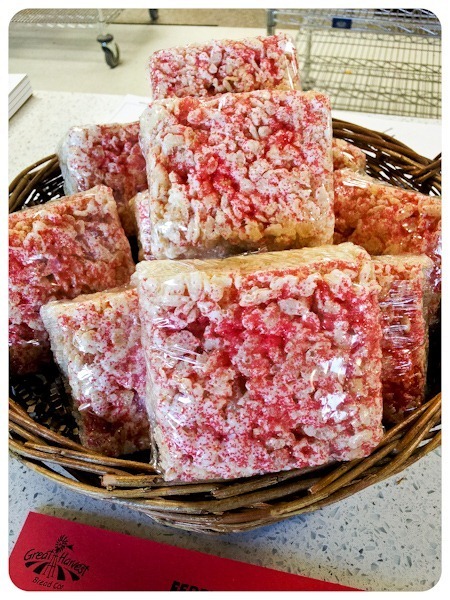 mmm… can’t remember the last time I had a Rice Krispie treat but they look amazing! With two boys in the house, I always have a batch of Dairy Free Rice Krispie treats on my kitchen counter. Truly a kid pleaser! Homemade are definitely the way to go…especially with real vanilla…I make my own and the kids think it makes all the differnce. That balsamic looks as thick as carmel…I bet there’s some honey or maple syrup in there? Rice Krispie Treats are the kind of thing that I never crave- but as soon as I have one, I remember how good they are! I always think about making various versions of them using different cereals and other add-ins (but have yet to do much experimenting!). Recently tried the Smart Dogs vegetarian sausages. They were delicous! Rice Krispies Treats certainly bring back childhood memories and everyone has their favorite variations. What is your favorite? I preferred them on the thicker and crunchier/drier side rather than gooey and sticky, and loved them with peanut butter or butterscotch chips melted in. Of course the ones made with peanut butter and then topped with chocolate were a favorite. I made a variation last week with cinnamon M&Ms and chocolate drizzle on top that everyone enjoyed. I have a bar that I make for holidays that used a yellow cake mix, egg and butter for a base that you bake then add marshmallows on top, followed by a caramel like mixture that you add rice krispies, nuts and M&Ms to and spread on top. We love chicken sausage here, Trader Joes and the Al Fresco brands, we also used to get some from Sam’s. My kids have some TJ’s sundried tomato chicken meatballs in their lunch today. Can’t wait to see the dressing recipe, thanks for sharing! I like they pull-apart gooey! Yum! Rice krispie treats! I can’t remember the last time I had a rice krispie treat. Those rice krispie treats look yummy – it’s been a while since I’ve had one! My favorite variation as a kid was a version made with cheerios and peanut butter – yum. Those rice krispie treats are so festive! Love them! 🙂 Gossip Girl was good last night!!! Rice Krispie treats are so scrumptous! I love to eat them, but have not had them in a long time! It may have been even longer than four years. Now I want a krispie treat 🙂 Love that they’re pink. I am definitely hoping you’ll be able to post the recipe for that dressing… until that happens, it will continue to be chocolate sauce in my mind! haha, yuck! That dressing looks amazing!!! My mouth is watering just looking at it. Those Krispie Treats are so yummy!